The internet is a crazy wonderful thing. It gives you all kinds of ideas that just pop Up! So I saw an add for a cell phone booster and I wondered if it can boost you signal enough to,use in a navigation scenario where you would. Ordnarily have no service? If you have cell service it will give you better cell service. They are nice for sure. If you are in an area with no service then there is nothing for it to boost. They are not magic. They are a convenience but I would never use it thinking you don’t need paper maps and /or maps stored locally on a device. If you can find a booster prior to the FCC regulating the power is the one you want. The above is the most important thing to remember. They cannot turn nothing into something, but they can turn 1 bar into 2-3 bars and improve ability to stream etc. 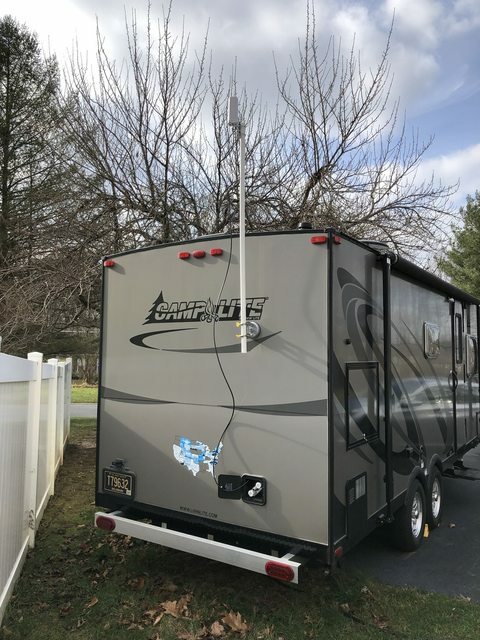 We have a WeBoost with pole mount external antenna on our all aluminum travel trailer which acts like a faraday box - ie. tough for a signal to get in/out of an aluminum box. We set a cell phone down next to the internal antenna, create a hotspot, and then use wifi for a streaming stick, laptop, whatever. Not sure why you need cell service for navigation? If you are using a cell phone to navigate with, don't you download the maps you need before you take off on your trip? The cell phone should have its own GPS chip built in which doesn't rely on a cell signal. If nothing else, buy yourself a cheap used dedicated GPS unit off Ebay, load it with free maps for the states you are interested in from gpsfiledepot.com, and you'll be good to go. Get a unit that takes SD cards - with a big enough card you can load maps for all 50 states, then activate the states you'll be traveling in. The cell service is to continually load the maps as you go. Without that you have to save the maps locally which can be expensive and take up massive space considering how much zoom you need. Not sure why you need cell service for navigation? If you are using a cell phone to navigate with, don't you download the maps you need before you take off on your trip? You are correct between downloading maps and the devices internal GPS, cell signal is not necessary and never count on it solely for navigation. The OP's question is a bit unclear and weirdly formatted, but I think I get the gist. Having traveled with folks on several occasions who had cell boosters, situations often come up where it's darned handy so I'd still consider it a useful tool. Cell signal is great for quick research of an area if your plans change on the fly or something unexpected comes up. Or you just plain made a mistake, forgot to download something 5 minutes online can fix. You don't have to go quite as far out of your way with a booster, so long as you can get the booster a clear connection via the more appropriately positioned antenna, you can actually have a conversation or look up information instead of driving another 5-10 miles hunting the tower. Perch yourself on top a hill and odds get even better. So to be clear, as stated it has to have something to boost, so it's not going to give you signal where there is none. However, the antenna in a cell phone is awful for range, sitting inside a vehicle is awful for range, so it could get you signal your device itself can't pick up from the cab, and it's going to be better than getting out, climbing on the roof, and slowly rotating your body to find the angle where your head doesn't block that one bar you might pull in. I've considered getting one but haven't reached a place where I think it's worth it to me for the cost. Don't expect miracles, but it can turn a signal the device can't pull in or detect by itself into a usable connection. I have the same trailer as you, and note the same issues with it insulating against cell signal. Do you have a booster or just an external antenna on the pole? I am new to this tech. I have a Wilson Sleek. It does a nice job amplifying an existing but weak signal. DO NOT BUY A 3G CELL PHONE BOOSTER. They're going to be useless soon. 3G as a standard is on its way out - Verizon and T-Mobile are sunsetting their 3G infrastructure - Verizon by the end of 2019, AT&T in 2021. No US carriers have authorized any new 3G devices since early 2018, so that's why you're seeing 3G cellphone boosters under $100 - they're old and outdated. Based on how much 4G boosters cost for something that needs to be useful for a few years, I think I'd rather have an Iridium GO! hotspot and a pay-as-you-go subscription. Coverage anywhere you want to go including triple-canopy jungle. You can throw it in your backpack if you have to go mobile and it tethers to your smartphone, with a 100-ft radius. If all you're doing is mapping, then your cell phone has plenty of storage, especially with an SD card. Backcountry Navigator costs something like $12 for a lifetime and unlimited downloads to as detailed as you're ever going to get - I have about 3GB of maps covering nearly the entire West downloaded on my external SD card. That plus an InReach will keep you as in-touch as you'll ever need to be.